We measure, cut and fit wall paneling for Dublin households. Flat is an older style of wall paneling. This design was popularised in the 18th century. It is the simplest of the designs we offer, but sometimes simplicity is exactly what you need. V-Groove or Beadboard is a wall paneling style that creates the illusion of height, with the tall lines giving the space verticality. This design is perfect for floor to ceiling accent wall or to border a room. 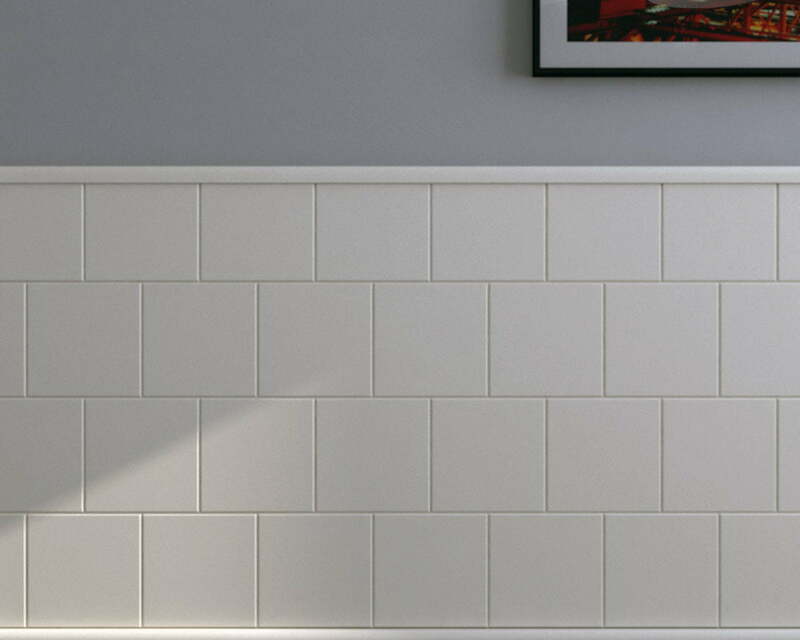 Tile style wall paneling is built to mimic the look and feel of the very popular large, white, ceramic tiles that are installed often in kitchens and bathrooms, but much sturdier and still moisture resistant. Fill out the form below and one of our carpenters will get in touch with you. Fill out the form below and one of our carpenters will get in touch with you. Your estimation will appear here. Wall paneling was historically developed to make stone buildings more comfortable to live in. They insulated a room from the outside cold. Nowadays wood paneling is used for decorative purposes. You can incorporate wood panels into an interior design achieving a sophisticated and clean look. A wood wall panel is usually a flat and single piece of material. It is usually placed at the base of the internal wall or covering it entirely. It can vary in height, thickness and design. To create wall panels we use high quality, durable, hidrofugo (moisture resistant) MDF. Our material and manufacturing process allow us to achieve our pre-made designs, patterns and textures. Wainscoting, also known as wall paneling, is an excellent attribute to your interior design. We offer four types of paneling to choose from. You can either cover all areas in the house or just one wall of the room. 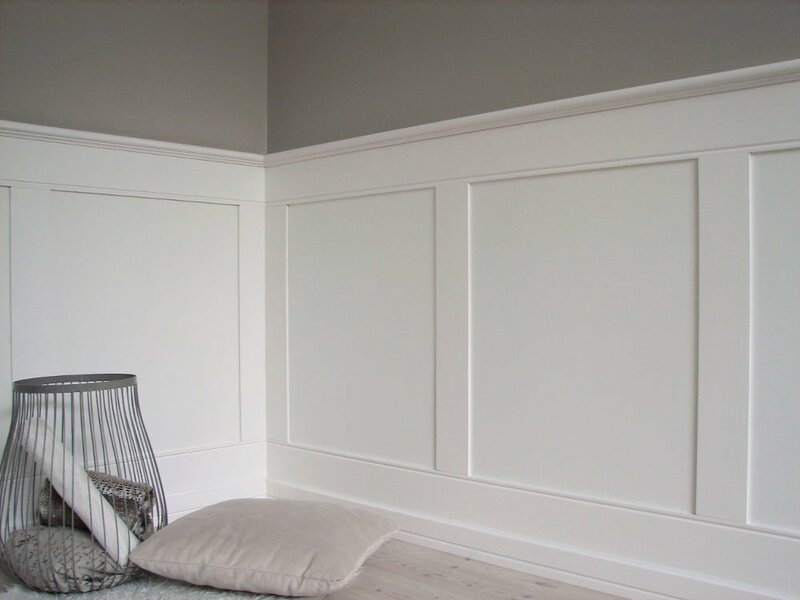 Wainscoting is made from a highly durable material and will last for a very long time. Here’s a few ways you can use wainscoting in your interior design to make a difference. A hallway is the first room you will see when you enter a house. If you want to create an aesthetically clean impression of your hallway wainscoting will give it a luxurious and elegant look. Although wainscoting has a traditional feel it is a modern and sophisticated interior design choice. Usually the tone chosen for the panels is white allowing for flexibility when selecting the colours and textures for the rest of the wall. Wainscoting is always a stunning addition to a staircase decor. A staircase holds a lot of character in the house through the use of high quality long lasting wood and the intricate designs detailing the balusters. Adding another layer to the staircase character - such as wainscoting - will be striking to look at. Wainscoting can be paired with artwork on the walls or a hand rail of contrasting wood. We supply and fit high quality wall panels for Dublin homeowners. Choose your style and get in touch with us to order your panels today. You can expand the visual space of a living room if you cover one wall of the room with wainscoting. The design of Beadboard panels, which you can find as part of our paneling selection, will visually heighten the walls. The cottage cosiness of the panel pattern will add a country feel to the room. Decorating a kids room with wainscoting is an elegant way to achieve a fresh and tidy look. You can experiment with the heights of the panels and fun patterned wallpaper or simply paint the walls and use standard height wainscoting. Wainscoting is a graceful and beguiling element of your bathroom decor, especially if you have a bathtub with elaborately decorated feet. You can add a plate rail to a wall panel to increase functionality, such as easy access to bathroom essentials. Wainscoting panels can last for decades if manufactured and installed correctly. We use high quality, moisture resistant MDF to create wainscoting panels. MDF is a material made by breaking down hardwood into wood fibres. The sheets are then formed by combining the wood fibres with wax and a resin binder under high temperatures and pressure. Do you want a sophisticated and clean look to your home? We will offer the best designs to suit your home decor. Our team of experts will advise you on the size and finishes for your wall panels. As part of our specialty we are happy to offer bunk beds for your kids bedrooms when considering an upgrade. Copyright 2018 Wall Paneling. All rights reserved.